"So, do you only date guys with one arm, or will you also date two-armed guys?" I smile. "Well, I usually only date one-armed guys, but I suppose I could make an exception." And that was more or less the beginning. Three months later, we're still dating. How did this happen? He says, "She threw herself at me." She says, "He wouldn't leave me alone." Honestly, I don't really know how it came about, but now, in what can only be described as an alien reality, I am someone's girlfriend. But if I am going to be a girlfriend, I think I'm blossoming into the sort of girlfriend I'd like to be under his care. It started with a bouquet of wild flowers on our first date that his three lovely daughters helped to assemble. I like to say I'm dating a Mountain Man. He makes snow for a living and he lives in the country. He owns a husky called Ivan. Need I say more? When the owner of Java Joe's asks if I have plans for New Year's Eve, I feel ridiculously sheepish answering that I am going to surprise my boyfriend at work. It's like the first time I went to buy alcohol after I turned 21––I was certain the cashier knew I was an amateur. But even an amateur girlfriend knows that when you have the opportunity to get kissed on New Year's Eve, in the dark, on top of a snow-covered mountain, you take it. And that's why I find it kind of odd he actually believes that since he has to work, I'm just going to bed early. Obviously, he's never dated a one-armed girl before. Challenge is my middle name. Mountain Man knows a thing or two about challenge, himself. He's had the sort of life that might inspire a Francis Ford Coppola film; something like Almost Famous meets The Godfather. His mother married into the mob, literally, making MM the last in a line of same-named gangsters with a direct line back to Italy. I'd tell you which name, but I'd have to kill you. But his mom escaped to the west coast when he was young, so MM grew up into more of a Bob Marley-loving stoner. He still talks of freeways with articles and begins too many sentences with "Hey, man..."
Around 9pm, I head east on "the" 40. At the end of MM's snow-packed lane, I call his cell. "Hey. So, I was thinking about spending the night in a snowcat on the mountain..."
"Ok." He's fully awake now. "I have to get up and get ready and....do you want me to come get you?" "Well, I'm at the end of your driveway, so it would be nice if you just let me in the gate." Though he's worked nearly everything from construction to film publicity, right now MM is happiest driving the spider-like snowcat, grooming ski runs all night for the following day. Sometimes he actually gets to ski the slopes that he combs. As we crawl up the mountain, New Year's beers in hand, MM points out rough spots and icy patches. He's an artist in his precision. It can't be too slick or too bumpy; it has to be just right. MM has an eye for detail. I find a packet of tissues and chapstick in my vest pocket. Mountain Man has a girl's needs in mind. He has to: he's singly caring for three daughters. This is one of the things I love most about him––though I frequently have to clarify to him that dating a father is not like dating your father. 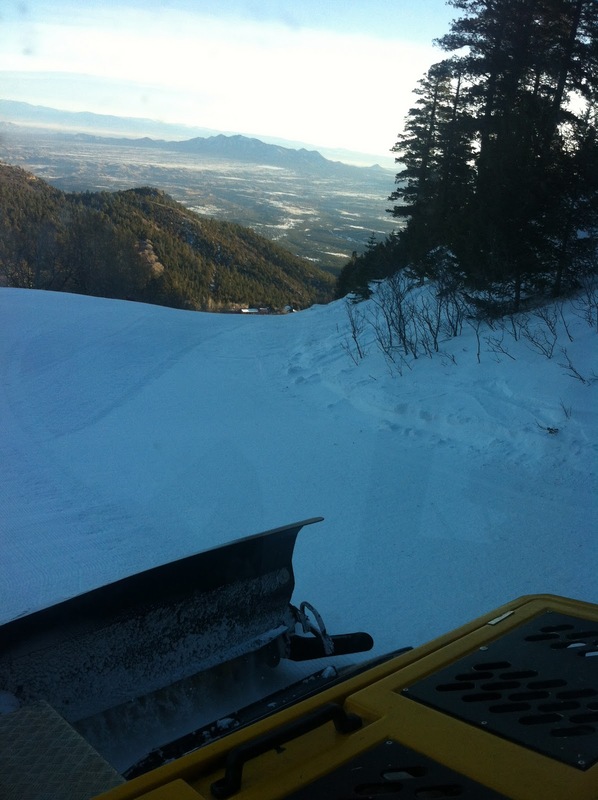 At the top of the mountain, we leave the warmth of the snowcat and walk to the lookout on the other side. The city spreads out in twinkly lights. I haven't stayed up all night since high school and I'm surprised I manage to keep awake despite the gentle rocking of the snowcat; though I wouldn't say I was awake, exactly. It was much more plausible that I was dreaming, in a spaceship with a single spotlight eye, hovering over the snow, passing trees made alive with dancing shadows. Suddenly the indie station we're picking up from Santa Fe plays a song about a girl called Peg who only has one leg. MM and I look at each other. I can't argue this isn't one of many 'signs' MM sees on a daily basis. Though a sign of what, I couldn't say. Everything is surreal, to use one of MM's favorite words. I've explained to him that if you describe most of your life as surreal, it kind of negates the definition. Then he tells me, "You know, you're pretty unique." Sigh. I'm not sure how many times we stop for me to run into the woods and pee in three feet of snow; wondering how much time I have before MM or the resident mountain lion comes looking for me, not sure which of those two prospects is more terrifying. But long before I expect, the first day of 2012 is lighting the horizon. Our shift is ending with the start of day. We make our way down the mountain, adding last minute touches to the masterpiece. A man skis past us, his dog running behind him. After bedding down the cat, we walk hand-in-hand to the parking lot. I think I could get used to this girlfriend thing.